I love rhubarb. But there are two problems with it: first, it’s next to impossible to find. Second, for some reason more than half of the recipes I attempt aren’t “all that”. 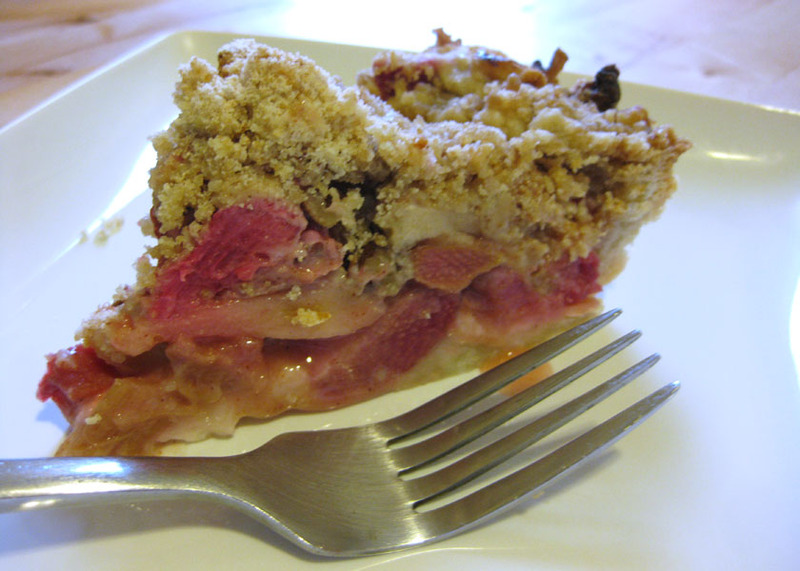 I think I baked 4 different rhubarb recipes this year and this is the only one that deserves a blog post. In the coming days I will be taking a short road trip to Vermont. While there, my main dessert of choice will, stereotypically, be Ben & Jerry’s ice cream. Use a pie crust of your choice. I finally settled on Alton Brown’s crust, but use whatever you feel comfortable with. (Or use a pre-made frozen crust, but shhhh don’t tell.) This is a single-crust pie. Prepare crust from your favorite recipe. Roll into a 12-inch circle to fit a 9-inch pie plate. Fit into pie plate with attractive edges and refrigerate uncooked crust while preparing filling. Combine rhubarb, sugar, lemon juice, and apples. Toss and sprinkle with cinnamon, ¼ t salt, a 3 T flour. (If you like a thicker/less juicy pie, add a little bit more flour.) Spoon into prepared, uncooked crust. Combine remaining flour, remaining salt, and brown sugar. Cut butter into flour mixture with a pastry blender or two knives until mixture resembles coarse meal. Stir in walnuts (optional). Sprinkle crumb mixture evenly over rhubarb. Reduce oven temperature to 375 and bake for 30 more minutes or until pie is bubbly and crust is golden. Let cool for 15 minutes before serving. Refrigerate as necessary to help pie to thicken and set – this was key for me. 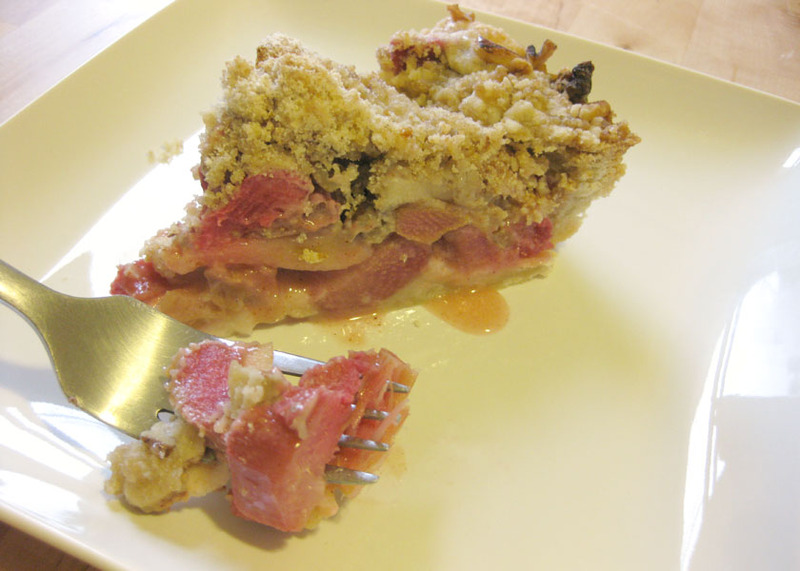 This entry was posted in Baking Jumbles and tagged apple, pie, rhubarb. Bookmark the permalink. We have a lot of rhubarb up here in the Pac NW. Lots of apples too. I should give this a try!